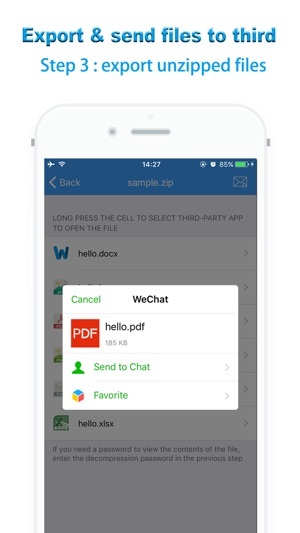 Rar, Zip, 7z files zip/unzip; File Manager; unzip/zip files in iCloud, Dropbox; album photo, video, iPod Music files zip & export. private vault, image text recognition. Decompress import local compressed files, computer WiFi upload files, you can also enter the network URL, download the network compressed files and extract. For compressed files with a password, the same can be extracted. 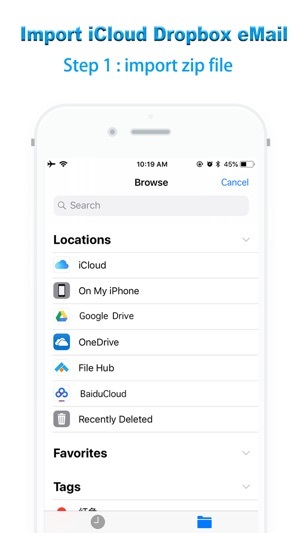 After decompression of the privacy file can be copied to the file safe box, file safe box support touchid and gesture dual certification, protection of privacy does not leak. Mobile phone privacy photos, video can also be easily imported. Mobile photos,videos in the album can be easily packaged compression. If you want to compress and decompress the files on your computer, you can upload to the phone with WiFi and easily complete the compression and decompression. 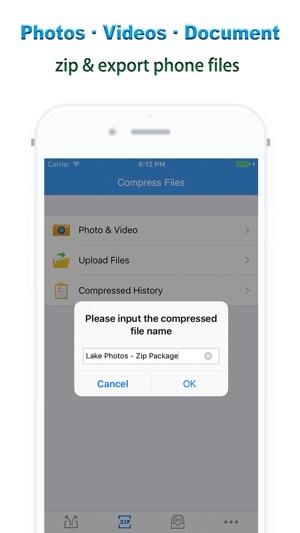 Compressed and decompressed files are easily exported with e-mail or third-party app and send to friends. 1. Add function of select compression, batch save photos and media files to albums, batch export, etc. I’m gonna dump this snd buy s less-threatening app. Recommend the same, + tape over the cameras, possibly a sliding mic muffler. Think of it this way, do you really want a choice of having a phone with you every time you and your SO recreate? Until the FBI claimed to have crackled iOS phone encryption a few months back, security seemed higher on iPhones than on the alternative Google/ABC and Microsoft OS alternatives. We know they are hole-ier than you wish. ex: I download a lot of music (zip albums) and each time I have to go back and forth over and over just to move one file and it takes a very long time. Something I noticed after the most recent update was that the icon for the app changed, however, in the help section, it was never updated to match with the new icon. This is a small bug, yes, but I think it should be fixed.